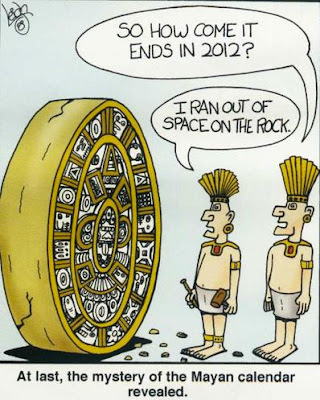 The World's Ending in 2012? Now That's An Injustice! The Month of Injustice marathon continues over at Huggy Bloggers Dot Com. Never have so many done so little for so few. But not me. Noooooo sirreee! I've been posting several blogs a week now aimed at combatting injustice, real or imagined. And it's time I draw your attention to the mother of injustices - and I'm not talking about Chelle B. Shave my feathers and call me Chicken Little but were you aware the world was coming to an end? Well pluck me! How unjust is that? The apocalypse is upon us - you, me and the four horses you rode in on. OMG, it's the end of the world! Never before has a date in history been so significant to so many cultures, so many religions, scientists and governments. '2012' is an epic adventure about a global cataclysm that brings an end to the world and tells of the heroic struggle of the survivors. The 2012 phenomenon comprises a range of eschatological beliefs and proposals, which posit that cataclysmic or transformative events will occur on or around December 21, in the year 2012, which is said to be the end of a 5,125 year-long Mayan Long Count calendar. These beliefs may derive in part from archaeoastronomical speculation, alternative interpretations of mythology, numerological constructions, or alleged prophecies from extraterrestrial beings. Holy poop, sounds serious. We have to do something to prevent the injustice of such an apocalypse. And my wife may want to re-think what she said to me the other day. "Oh Dufus, you're only turning 60 in 2012. It's not the end of the world"
Well, call me "apathetic". I don't think there's really a dime's worth of difference between any of the politicians. Sarah Palin in 2012 or not - stick me with a fork, I'm done. Great take on this "hot" topic. I love the cartoon showing "I ran out of space." Me-Me: I'm with you. Pretty much the same thing here in Canada. And the latest rumour is Lou Dobbs is contemplating running down there. I love American politics! Quirks: It'll be an apocalypse enough when I turn 60!!! My 9 year old daughter proclaimed to her CCD class (Catholicism class) that the world was going to end in 2012. Yet ANOTHER church we can't return to. Moooooog: Yeah, what's with all this "world's gonna end talk" AGAIN? Remember Nostradamus? Are you running out of religions, Moog? Won't matter. Haven't you heard? The world's gonna end in 2012. I say we all start sinning, big time. Bring it on...! 2012 sounds good to me although I wouldn't worry too much about Palin becoming president. Perhaps a senator...I'm more concerned about if we get a tax break on groceries here if the world begins to vaporize in 2012. Don: Don't think you have to worry about a tax break if the world starts to vaporize. Can you say looting? OK, we're doomed. I say we start partying now and don't quit until we go out in a blaze of glory. That Palin 2012 sticker is one of the scariest things ever...next to the Palin/Dobbs sticker that will be coming soon. I mean, after all, didn't I hear somewhere that they got married? Yikes. It's the end of the world as we know it and I feel...like poop. I know it's not how the song goes...but if that happens, how I'll feel. "eschatological beliefs" - I didn't know the Mayans believed in escalators. They certainly were an advanced group. Mike: I've already started. Woo-hoo. UR: Hey, you've been visiting another, well-written and thoughtfully-intelligent blog, sounds like. Deb: Hey, the Mayans are on the up and up. Take it from ME. Wait, I thought the Y2K thing was supposed to wipe us out. Someone needs to revisit the story of the Little Mayan Who Cried Apocolypse. DK: Nah, that was 'why 2K?' not Y2K.